From office to factory floor to mobile field deployment, these chassis are built to meet the demands of rugged environments and applications requiring fixed and removable disks. Macrolink’s 100,000-cycle removable SAS/SATA SSD technology brings you true, hot-swap capabilities for system critical operation. The Cougar chassis has a front-mounted on/off switch, power “ON” and voltage “OK” indicators. A rear-mounted circuit breaker and line filter are also provided. A high temperature sensor automatically turns off the power supply and the voltage “OK” indicator when the internal temperature limits are exceeded. A front access door covers a VME/VPX, or cPCI 6U card cage with vibration dampened card guides. Ample room is provided behind the access door ensuring clearance for virtually any connector type. Cable routing to the rear panel is generous and neat. The hinged rear I/O panel accommodates standard 6U filler or I/O panels and provides easy access to the backplane. The Cougar has two or four mounting bays for removable drive modules. The removable drive modules accept any 3.5-inch SAS/SATA disk drives or SSDs. A fixed mounting location accommodates one full-height 5.25″ device or two half-height devices. The Cougar has handles on front and rear to aid in handling and installation. 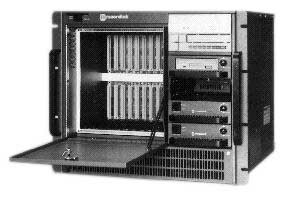 The chassis may be mounted on rails installed in a 19-inch rack or on optional slides. The mounting rails are included with the chassis. The front panel measures 19-inches wide, 15.75-inches high and the exterior enclosure measures 17-inches wide, 15.5-inches high and 22-inches long. 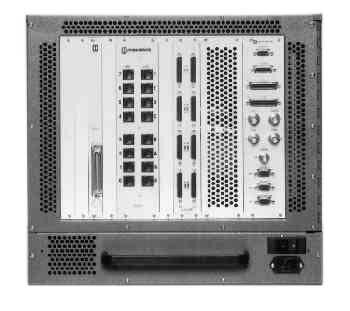 The weight of the 12-Slot Enclosure, without removable drive modules and VME boards, does not exceed 65 pounds. The removable drive module weight, with disk drive installed, is approximately 3.5 pounds. 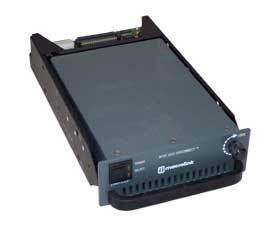 The removable drive module contains a shock-isolated, SAS/SATA 3.5-inch or 2.5-inch SSD drive, interface cables, and connector, which are engaged when installed in the enclosure. The module panel incorporates LED indicators for “Power” and “Select” as well as a power “On/Off” switch. The power switch controls the drive power and electrically disconnects the module from the bus. Our patented SCSI disconnect technology allows drive modules to be removed without interfering with other active SCSI bus devices. The drive module and receiver connectors are rated at 100,000+ removal cycles. The Cougar chassis contains an integrated, 750 W, auto-ranging power supply with an internal cooling fan. The power supply auto-ranges for both voltage and frequency. The lower front portion of the Cougar contains a filtered inlet for forced-air cooling. The filter excludes dust and foreign material from entering the enclosure. The filter is easily accessible and replaceable. There are three independent fan assemblies; one dedicated to the VME chassis, one to the peripheral bay, and the other to the power supply. 113-137 VDC 15 Amps maximum.